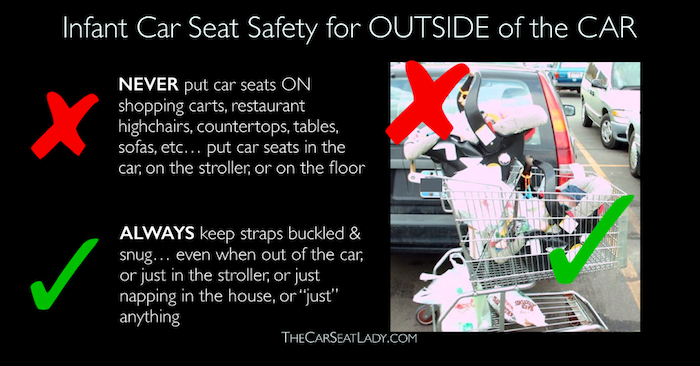 Parents use infant car seats as more than just car seats. Babies are often carried in these seats, ride in them on stroller frames, sit in them atop shopping carts, and nap in them while in the house and on the go. A 2010 study in the journal of the American Academy of Pediatrics found that nearly 10,000 babies in the US are injured each year in their infant car seats NOT in crashes, but rather while using the seats outside of the car. 1 in 10 of these babies are injured severely enough that they have to spend at least 1 night in the hospital. Of the injuries, 85% were related to falls – 65% of the infants fell out of the car seat, 15% fell from elevated surfaces (with shopping carts, tables, and counters being the most common surfaces). This entry was posted in Uncategorized on July 28, 2014 by terriborman.